Hendersonville Chamber Music got its start about 10-12 years ago; the non-profit group is an offshoot of the Swannannoa Chamber Music Festival. From the beginning, events routinely drew 75 to 100 people, says the group’s director, Howard Bakken. But for many years the group kept a relatively low profile. “I’ve been in Hendersonville for years,” Bakken says, “and I had never even heard of Hendersonville Chamber Music until maybe 8 years ago. He became the organization’s president in 2012, with the goal of getting the word out about the impressive concert series the group puts on every year. “My missionary zeal took over,” he says with a laugh. Howard Bakken did his Masters Degree at Yale School of Music, graduating 50 years ago. A retired public school teacher, Bakken is a lifelong admirer of classical music. Today Hendersonville Chamber Music hosts four performances every year, and Bakken is very much involved in the efforts to put together each year’s performance schedule. He mentions that one of the musicians in The Tesla Quartet (a featured performance of the 2017 season) is also a Yale graduate. “I’m just trying to bring all my friends home,” Bakken quips. The First Trumpet in the Smoky Mountain Brass Quintet was a good friend of Bakken’s organ teacher at the University of Illinois. In truth, he has met only one of these people, and then only briefly. But Bakken makes the point that the world of classical and chamber music is in fact quite small. And by bringing high caliber musicians to Hendersonville, he’s doing his part to make it smaller still. Part of Bakken’s goal for the group is to expand the public’s perception of what exactly constitutes chamber music. “Time was,” he says, “people thought chamber music was only a string quartet. Maybe a piano or string trio.” Under his direction, Hendersonville Chamber Music has sought to carefully expand that definition. One of the first bookings the group made with that in mind was the acclaimed viola-flute-harp ensemble, Fire Pink Trio. Since very few works have been written specifically for that instrumental configuration – late 18th and early 19th century composer Claude Debussy is one of the few who composed for those three instruments – Bakken says that the trio “pushed the envelope and commissioned new works.” In the process, they and other like-minded ensembles are bringing chamber music into the 21st century. Hendersonville Chamber Music makes a point of scheduling its concert series between March and May; that way the performances are less likely to be canceled due to inclement winter weather. The performance schedule is also designed not to conflict with other obligations potential concertgoers might have; each season concludes before Mother’s Day and graduation ceremonies. Performances are held at The First Congregational Church just west of downtown Hendersonville. Because many of the touring performers are in great demand, Hendersonville Chamber Music routinely books its schedule as much as a year in advance. That advance planning also means that the program for each performance is available for review months before each concert. Bakken says that helps, because there’s a certain sort of concertgoer who wants to know exactly what pieces will be performed. Hendersonville Chamber Music seeks to satisfy those people as well as others who might be a bit more musically adventurous. Founded in 2006 at the Manhattan School of Music, The Zodiac Trio was one of the 2017 season’s highlights. 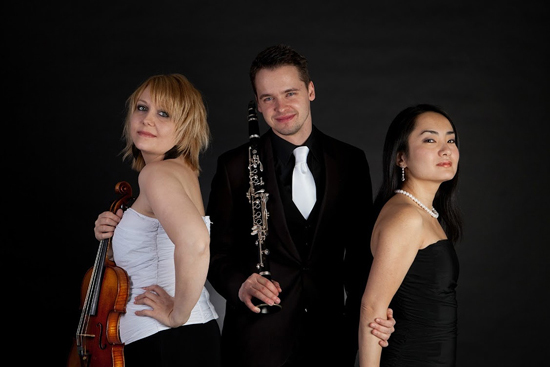 The trio’s unusual configuration – pianist Riko Higuma, clarinetist Kliment Karlovskiy and violinist Vanessa Mollard – presents a winning combination of classic and modern compositions. The March 26 program will include works by Aram Khachaturian, Peter Shickele, Béla Bartók and other composers. “The number one priority is always the melodic integrity of the original piece,” says Krilovskiy. Hendersonville Chamber Music does its part to make intimate classical performances accessible to a younger audience. “We admit students without charge,” Bakken says. “whether they’re in nursery school or in a graduate program.” That policy also encourages a diverse audience for the chamber music concerts. For non-students, tickets for Hendersonville Chamber Music’s concerts can be purchased individually for $25, but a discounted four-concert subscription ($80) offers savings and flexibility. The latter allows one person to attend four shows, or two to attend two performances, and so on. Bakken says that the subscription option is a popular one. Tickets are available online at hendersonvillechambermusic.org.